Do you remember how the wobbling bridge physics problem used to excite or trouble us in school days? As it seems, a group of scientists at the Georgia State University has finally found ways to reduce wobbling of pedestrian bridges (except mechanically not reaching the condition). Why does a bridge wobble in the first place? 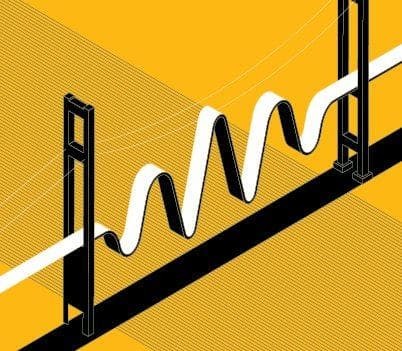 An article published in Science Advances explained it with a well-known incident of London Millennium Bridge that suddenly started wobbling in its opening ceremony due to pedestrian-bridge interactions, causing large lateral vibrations. As people walk along a bridge, they unintentionally match their footsteps and with more crowd, they manage to match the bridge's frequency. Once the critical mass is reached, the applied force becomes enough to show vibrations. So, what is the solution? The team of scientists proposed about a biomechanically induced model learned from the pedestrian response to bridge motion and worked with a mathematical formula that determines the critical mass which starts the bridge wobbling phenomenon. The article reports two more incidents, one in Bristol and another in New York that caused a similar problem. The team, however, goes against the popular belief that, increasing the crowd size would increase the vibrations. However, the team explains that there is a threshold size above which it will cause more vigorous oscillations. Talking about their research, Dr. Igor Belykh, professor in the Department of Mathematics and Statistics at Georgia State explained that the biomechanical model in conjunction with the mathematical formula will limit the size of the crowd in an existing bridge and will help designers build better bridges. The result emphasizes the crucial understanding of crowd dynamics on a wobbly bridge. The current methods only include linear elements but the inclusion of inclusion of biomechanical models just like the one in talks, into software and designing would better predict the interaction between marching pedestrians and a swaying bridge via non-linear effects. According to a previous report, engineers found the primary relation between critical crowd size and bridge wobbling. The critical crowd size of 165 is what required to create vibrations in London Millennium bridge but lesser than the threshold would not disrupt its stability. The paper also highlights that matching of pedestrian foot movement might not initiate the vibrations but it deeply instigate the oscillations. Also, synchronization of pedestrian foot movement is not a necessary condition for the bridge wobbling condition is an important takeaway. The complete research has been published in Science Advances.